“In the year 1970 farmers received subsidy of Rs. 3000/acre from Government to grow rubber in their farms therefore we farmers cleared our farmlands to grow rubber. Subsequently we started losing our state’s treasure ‘jackfruit’. After few years, I could reinvent my faith in jackfruit when my blood pressure level controlled and overall health improved by eating jackfruit regularly! After all jackfruit is packed with vital nutrients and medicinal properties as it is naturally grown fruit. There is no requirement of any sorts of chemical agri inputs to nurture the tree. I am convinced of its curing properties thus started collecting and preserving jackfruit varieties from across the state, country and world,” Mr. Thomas Kattakkayam describes the drive to conserve the fruit. Mr. Thomas, 75, hails from Pala, Kottayam district, Kerela. The entire region is referred as rubber belt. Now slowly with the efforts of Mr. Thomas jackfruit is returning back in the farms. 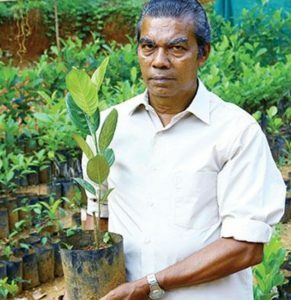 He owns 10 acre farm in which 2 acre has jackfruit plantation exclusively while rest of the farm has a good mix of forest trees along with rubber. So far he has been successfully able to secure and protect 210 plus varieties of jackfruit. 80% jackfruit varieties in the collection have been procured from Kerala state (Kottayam district) while remaining 20% is sourced from other Indian states as well as other countries. All the varieties differ from one another in respect to colour, taste and aroma. The fruit has to pass the stringent taste test of Mr. Thomas before it is selected to be included in his collection. “So far only 40% jackfruit that I tasted got selected!” he says. Jackfruit is monoecious that implies male and female flowers are borne on the same individual tree therefore every tree is distinctive. When asked about the taste and aroma specific features in his collection, he shares, “I have 12 ‘Varikka’ jackfruits variants. All differ from one another such as one tastes like honey while other has the aroma of ginger. There is one red-fleshed jackfruit having bright red carpels,” he asserts. Mr. Thomas wants more and more farmers to grow this fruit variant as it is low maintenance tree, requires less attention and is naturally organic thus he prepares best quality budding seedlings for other farmers. He observes his trees closely, evaluates its qualities and then selects the best of all for propagation. Ready stock of jackfruit budding of all popular and fast moving varieties is always available at the farm. “In my collection there are 25 high-yielding varieties. Amongst these ‘All Season Jack’ budding gets sold off just in couple of days. It is rapidly gaining the attention amongst the farmers,” he states. Jackfruit budding must be planted keeping the distance of 20 feet between two trees. In time to come Mr. Thomas plans to make feed for livestock from the left over part of jackfruit after taking out the bulbs. “Besides, my immediate plan is to prepare 20 thousand budding every year for regular supply to other farmers. Also I am clearing another 1.5 acre in my farm for new jackfruit plantation,” he reveals. IPR Cell of Kerala Agricultural University is extending immense support to Mr. Thomas for his notable work in crop conservation. They intend to bring the farmer into limelight for his dedication for jackfruit. Jackfruit is a natural medicine for the people suffering from lifestyle diseases such as diabeties, blood pressure etc. Its’ demand is surely going to increase, “So farmers must start growing this tree in their farms. Further, jackfruit is one of the few fruits that is free from all contamination and does not have harmful chemical residue. Only with cow based farming inputs the tree grows well and yields good quality of fruits. It surely will be rewarding for the farmers in the long run. I am preserving these distinctive varieties for future generation as well as restoring health of my countrymen,” he concludes.